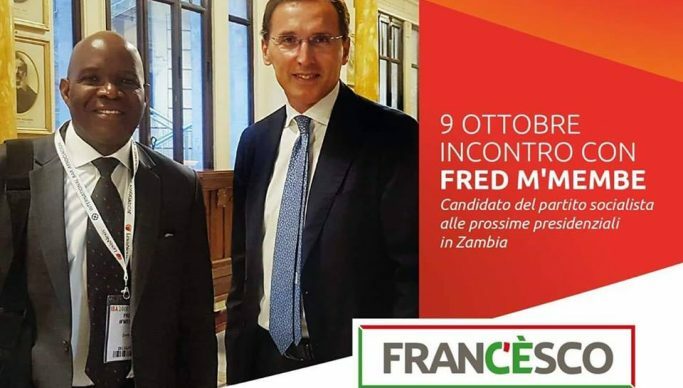 Socialist Party 2021 presidential candidate Fred M’membe’s meeting with Italy’s main opposition, Democratic Party member of parliament in the Italian House of Commons, Francesco Boccia, has generated interest and likes among followers of the later on his Facebook Page. On Tuesday, Dr M’membe met with the centre-left party leader and established links for further cooperation and collaboration between the two parties. And The Mast newspaper reported on Thursday that during the meeting at Italy’s parliament building in Rome on Tuesday, Boccia informed Dr M’membe that he had announced his candidature for the leadership of the Democratic Party. He is contesting the secretary of the party. According to The Mast, the two discussed how best they would work together to end the growing inequality and unemployment in the world. During the discussion, the Socialist Party (Zambia) sought help with training and development of cadres and party organisation. “We analysed the position of the left in Europe, Africa and the world at large. We looked at the strategies of the left in the light of growing narrow nationalism of the right and far right,” said Dr M’membe. The two leaders agreed to deepen contacts and collaboration between their parties. “We agreed to cooperate in the campaigns on environmental issues, growing global inequality and unemployment which neoliberal capitalism cannot solve. The Democratic Party offered to help in national budget preparations and research,” said Dr M’membe. Boccia wished Dr M’membe the best in the preparations for the 2021 presidential elections. Dr M’membe equally wished Boccia well in the forthcoming Democratic Party leadership contest.